(CNN) -- Samuel Eto'o arrived in Milan on Monday to complete his transfer to Inter in a swap deal which sends Zlatan Ibrahimovic to his former club Barcelona. Prolific striker Samuel Eto'o is on the verge of moving to Serie A with Jose Mourinho's Inter Milan. The Cameroon international will reportedly sign a five-year contract worth almost $15 million per season with the current Serie A champions. Eto'o is undergoing a medical in Milan before being officially unveiled, but is already looking forward to the new season. "I'm very happy to be at Inter. I'm here to work and win the Champions League," he told the club's official Web site. He was also delighted that his new team had made a good start to pre-season with a 2-0 win over arch-rivals AC Milan in a friendly tournament in the United States on Sunday. "Compliments to my teammates, who have already won the first derby of the season," he added. Eto'o was top scorer for treble-winning Barcelona last season with 34 goals, but annoyed the Spanish giants while being courted by English club Manchester City. Coach Pep Guardiola later stated it would be best for the club if the player left despite him having been offered a new contract. 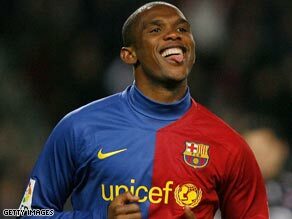 Eto'o will leave the Nou Camp as the fourth highest goalscorer in the club's history and netted in both finals as Barcelona won the Champions League in 2006 and 2009. Barcelona midfielder Alexander Hleb is also coming to Inter on loan as part of the deal, with the Italian giants receiving a reported $46 million as compensation for losing a striker who led the Serie A scoring charts last season. Meanwhile, Swedish international Ibrahimovic is due to travel to Barcelona on Monday to complete the formalities of his deal with the Catalan giants.